Navneet Goenka, CEO of GLITZKOIN made an important statement, it obviously related to the DeBeers decision to sell synthetic diamonds. The CEO confirmed that, ‘…. there would be no room for synthetic and fake diamonds on the GLITZKOIN diamond blockchain…’. DeBeers has for long claimed to be the most reputed diamond company, there was a time when almost 90% of the diamonds that entered world markets, passed through the company. Set up in 1888, DeBeers has been around for more than a century. As time went by, DeBeers did little for the industry and preferred to bask in its old glory. Diamond industry stalwarts realized that, they could manage on their own and did not need to be supervised or governed by the diamond giant. A decentralization of sorts took place, diamond trade and mining opened up and DeBeers was no longer the godfather to the industry. In 2018 DeBeers launched its diamond blockchain, no diamond trade and no crypto currency. The idea was to maintain a master list of diamonds across the globe. This did not make big news, it was only a small section of the crypto world that really understood what that meant. With no trading platform and no plan to launch a cryptocurrency, there was nothing to build excitement. Many experts were of the opinion that, news of the DeBeers diamond blockchain was meant to do nothing more than to keep the company in the news. 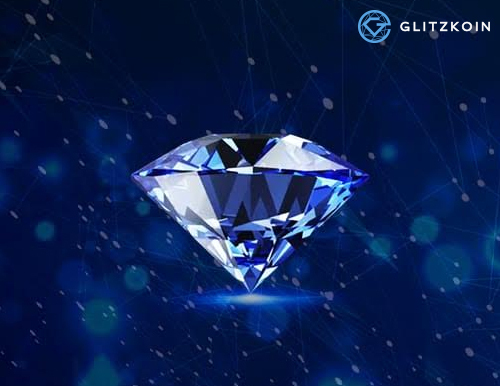 It was obviously bad timing for the company, GLITZKOIN with its superior blockchain based diamond trading platform and crypto currency had already impressed industry leaders. Apparently in desperation, the company announced in May 2018 that, synthetic diamonds would soon form a product line in the DeBeers collection. Navneet Goenka voiced industry sentiments, ‘…. there is nothing that DeBeers has really done for the industry in the past half century, they kept losing importance and have ended up becoming quite irrelevant. But the decision to sell fake factory made diamonds is absolutely deplorable…’. Diamonds are sought after for their rarity and natural beauty, diamond connoisseurs shun even natural diamonds that have been treated to enhance their beauty. And we are now told that, DeBeers will soon start selling fake diamonds. We might soon arrive at a situation where, DeBeers makes fake diamonds, raises a huge market hype and then sells those fakes at exorbitant prices. For second generation diamond veteran and CEO of Glitzkoin, Navneet Goenka – true diamond lovers will not settle for anything other than natural diamonds. Interestingly one of the prime objectives of the Glitzkoin project is to eliminate the sale of fake diamonds. It is now clear that there will no listing of fake diamonds (of any type) on the Glitzkoin diamond blockchain.